This is a band put together by Martijn Westerholt, who used to play keys for Within Temptation in the old days, before he had to quit due to health issues. Now he's got a band together that unsurprisingly sounds a lot like Within Temptation, and I would be so not caring if this wasn't a good album all on its own. This is a very strong album for a debut. The opener "Sever" is pretty standard chick-fronted Goth metal, but then "Frozen" gets going and you realize this band has more to offer than that. There are some very fine songs on this disc, starting with the addictive "Frozen" and continuing through "Silhouette Of A Dancer", "See Me In Shadow", "The Gathering" and the lovely "Day For Ghosts". Singer Charlotte Wessels is a real find, as she has a captivatingly beautiful voice, warm and haunting and fragile all at once. Her expressive voice really brings this album up a notch. A big notch. Plus in several places the band has enlisted the superlative Marco Hietala as a guest vocalist, which shows extraordinary good taste, as the man can do no wrong. 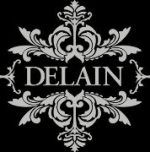 Delain are coming into a genre crowded with lots of genuinely good bands, as well as a whole lot of wannabes, but they manage to stand out from the mass with a sharp, strong debut that I hope gets them enough attention to keep going. With the latest Within Temptation album such a let-down, I can have hopes that Delain are going places.